A reader informed me that arstechnica.com updated their article. Now it appears the Verizon Pixel will get both system updates and security patches from Google. Verizon contacts ars and informed them this was the case. 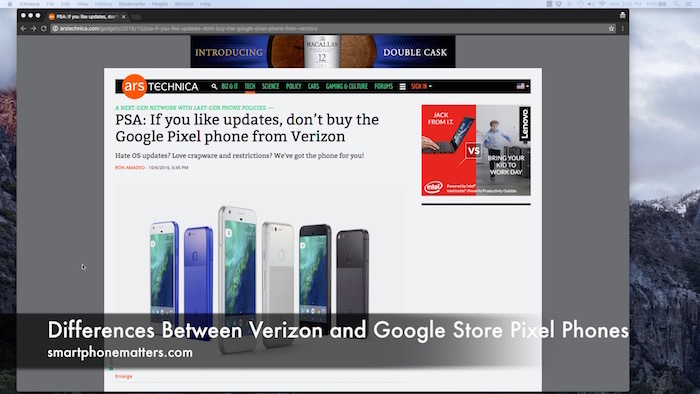 I was disappointed that ars and their original source 9to5google, didn’t ask Verizon to comment before publishing. I am glad to see Google and Verizon adopting a model similar to what Apple uses with the iPhone where iOS updates come directly from the phone manufacturer rather than carrier. This is a positive step forward and will keep long time Nexus fans happy. Today, I found an article on Arstechnica.com, PSA: If you like updates, don’t buy the Google Pixel phone from Verizon. While the title and subtitle are inflammatory and sound like click bait, I wanted to talk about some interesting points in the article. According to the author, Google has told 9to5Google, that while all Google Pixel phones will get monthly security updates directly from Google, only the unlocked phones purchased from the Google Store will receive system updates directly from Google. Verizon will manage if and when the Verizon sold Pixel phones receive updates. The article goes on to state that the Pixel is sold unlocked by Google, Verizon, Best Buy, Target and Walmart. This leads me to wonder if the Pixel phones sold by Best Buy, Target, and Walmart are being sold as unlocked carrier free phones or are being sold by those three because they are Verizon resellers. All Pixel phones should be unlocked regardless as all Verizon LTE compatible phones have been sold unlocked for years now. I suspect phones from these three stores will be considered Verizon phones and depend on Verizon for updates. According to the quote from Google above only the Pixel phones from the Google store get system updates from Google, so I’m thinking these must be Verizon phones. The article also goes on to point out that the Pixel’s “Verizon Exclusive” marketing is confusing as the phone is also sold for Project Fi, unlocked from Google, and is compatible with any major US carrier. I was glad to read that someone who reports on this stuff full time also found this confusing as I mentioned in a previous video. Finally the article states that the Verizon Pixel has delayed major updates, a locked bootloader, and has un-installable Verizon crapware and people should buy the Pixel directly from Google. I’d agree with the advice that you should buy the phone directly from Google if you are a Verizon customer as long as the phone is fully compatible with the Verizon network. I’d want to know that the Google Store version of the phone is compatible with Verizon HD Voice and VoLTE features such as Wi-Fi calling. I can understand that some users will be annoyed by a locked bootloader which will prevent rooting the Pixel but can understand that a major carrier would prefer a locked bootloader. In fairness we don’t know if major updates will be provided by Verizon or on what schedule so we can only speculate based on prior behavior. Finally I believe the Verizon crapware point is being sensationalized. When you read “uninstallable” it sounds like you cannot remove the Verizon apps but in fact according to the Business Insider article it links to, the apps can be removed (uninstalled). Also we can see that Verizon is preinstalling, My Verizon, 90Go, and Verizon Messages. My Verizon is the app used to manage your Verizon account, I think its reasonable to preinstall that especially if I can remove it if I like. I don’t know what 90Go is, and I know Verizon Messages is some type of SMS app, I don’t know what benefits it has or why I’d want to use it. At least they can be removed. All in all this article had some useful information but left me with a few unanswered questions.